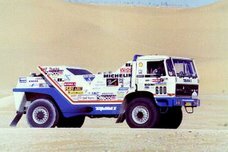 One of the best sites for Dakar models is Volker Preikschat's Racepaper.de. Volker's Dakar models are a recent development for him, Volker is known for his excellent designed DTM and F1 models, his Dakar models rival the quality of those models. One of the most exciting releases from Volker will be all the Car Winners from the first to the most recent Dakar races. The first release will be the 1980 winning car, the VW Ilits. I was planning on doing this similar thing in plastic, but I like this option alot better. If like me, you want to follow the releases, visit Volker's Dakar site.